In the Government Order 1st read above, guidelines for conducting Andhra Pradesh State Teacher Eligibility Test (AP-TET) under the Right of Children to Free and Compulsory Education Act (RTE), 2009 were issued for conducting Teachers Eligibility Test. 2. In the circumstances stated by the Commissioner of School Education, AP, in the letter 3rd read above, and after careful examination of the matter, Government hereby issue the following amendments to the aforesaid guidelines issued in G.O. Ms. No. 91, School Education (Exams) Department, Dated 11/12/2017 as amended in the G.O. 2nd read above. 3.1. MINIMUM QUALIFICATIONS FOR AP-TET PAPER-III (LANGUAGE TEACHERS) Graduation with Language concerned as one of the Optional Subjects (OR) Bachelor of Oriental Language (or its equivalent) (OR) Graduation in Literature (OR) Post Graduation in Language concerned AND Language Pandit Training Certificate/ B.Ed with Language concerned as one of the Methodologies, in respect of Language Teachers. The following Languages are offered under First Language in Secondary Schools under the State Syllabus viz., Telugu,Hindi, Urdu, English, Kannada, Tamil, Oriya, Marathi & Sanskrit. A Candidate has to choose one of these 8 Languages except English under Language I of TET, those candidates should have compulsorily studied that Language either as medium of study or First Language at least up to Class- X. The candidates who studied CBSE/ICSE curriculum can choose the Language which they studied up to Class X. Language Teachers have to choose the Language of their study in Pandit Training concerned under Language-I of TET Paper –III. Note (3): A candidate has to choose the English subject for TET examination, has to compulsorily choose the Telugu Language under Language I of TET. Note (4): The Language-II shall be English for all the candidates. 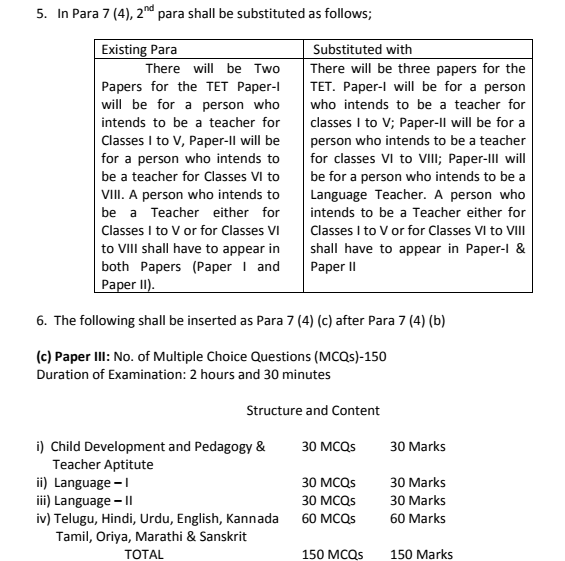 Note (5): For Paper –III Language Subject questions will be as:- Concerned Language Subject 60 MCQs (Content 48, Pedagogy 12) Note (6): For Paper III, the syllabi for TET of Concerned Language Teachers and are Special based on topics of Classes VI to VIII. The difficulty standard of questions as well as their linkages could be up to Senior Secondary Level (12 th Class). The SCERT will be providing the syllabi for Language Teachers. Note (7): The syllabi for Language I & II shall be based on proficiency in the Language, Elements of Language, Communication and Comprehension abilities (standard up to Senior Secondary Level (12 th Class) 2. These orders shall come into force with effect from the date of issue of G.O. Ms. No. 91, School Education (Exams) Department, dated 11/12/2017.